Last week we started exploring the backstory behind the Oyster Perpetual label. We looked at the Oyster case as conceived by Rolex. This post delves into the perpetual side of the equation. The Perpetual had its genesis in a movement by movement maker Aegler (from whom Rolex procured many/all their movements in the early days. The movement was called the Hunter (because of its crown at the 3:00 position and small seconds at 6:00, like a hunter pocket watch). The Hunter was born in 1922, and in one form or another, lasted 40 years, finally ending its life as the calibre 600. Meanwhile, thought the 1920s, several companies were working to develop a self-winding movement. Most resembled Rube Goldberg mechanisms, but one company, Harwood, had a patent for a rotating mass – a rotor – to wind the mainspring. The patent also included an effective method to prevent over-winding. This patent effectively limited development efforts by everyone else. Unfortunately, Harwood’s design and marketing efforts were also less than stellar. After all, this was the Art Deco 1920s, when tonneau, square, and rectangular shapes were the rage. Harwood’s watches were round. And their men’s and women’s watches were the same size. But Harwood soldiered on until finally, in 1929, they had no choice but to file for bankruptcy. Rolex and Aegler stepped in and developed a rotor-gear-spring mechanism of their own. This mechanism bolted directly onto the back of the existing Hunter movement. Now the Hunter movement was already being installed in the Oyster case. All that remained for the first Perpetual Oyster to be produced was a deeper case back. You guessed it – the bubbleback. And so the Oyster Perpetual was born. And of course, as was becoming their fashion, Rolex kept incrementally improving the movement and its case. In fact, numerous watches bearing only the name Oyster Perpetual have been produced, especially between the early 1930s and the end of the 1950s. Today every watch in Rolex’s Oyster Collection bears the name “Oyster Perpetual” right under the Rolex signature. Not bad for a watch launched at the height of the Great Depression. 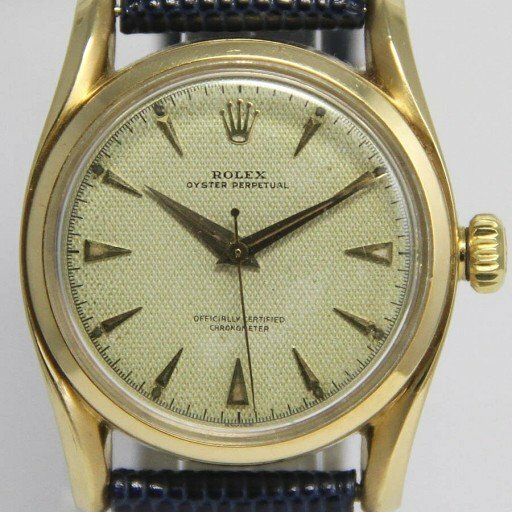 Ever wonder about the backstory of your favorite Rolex? Well, stick with us. This is the eleventh in a series of posts featuring histories of significant Rolex models. In all, Rolex has introduced nearly three dozen models since 1950. Over the next several weeks, we’ll touch on each. You’ll find all the reference numbers connected with each model here.